A few days ago Afsan Chowdhury, one of our best commentators on Bangladesh history and politics, posted a question on his Facebook wall, “So who thinks national governance will improve through the next election?” (April 9). This is a very important question to ask even in the middle of the apocalyptic battle that is now raging in the national arena. But as usual, in the comments thread following his question, attempts to take a stab at the question soon descended into who did what in 1971. What is the equivalent to Godwin’s Law in Bangladesh? To any longtime outside observers of Bangladesh, our national course in the last quarter of a century may seem to be eerily following a macabre perennial calendar, a plot that is a staple to many science fiction and fantasy novels. After many years of happy sunshine, a thousand days of darkness falls on the land and creatures of the dark come out. Winter has come! Every time after the pall of darkness is lifted, an election ushers a thousand years of peace and prosperity and most people are deliriously happy. But the dark clouds of Mordor bid their time behind the mountains knowing that their time will surely come again. Right now we are deep into the season of dark days and lot of messianic warriors around us is fighting their dream ‘final battle between good and evil’. But rest of the people are thinking that surely this cannot get any worse, surely we have reached the bottom, and surely this mad cycle of events cannot go on for ages. Perhaps most of the sane people in the country think that if nothing else, surely nature will take care of this deadly curse upon the nation when the twin ghosts of Sinbad shuffle off their mortal coil in the near future. I also used to subscribe to the view that a large part of our tribulation is due to our misfortune of being saddled with a unique set of circumstances. But what if, “The fault, dear Brutus, is not in our stars, But in ourselves, that we are underlings”? (1) If every nation gets the leaders it deserves then we are not going to escape this fate any time soon. The ongoing battles have once again laid bare the deep divisions in our society and our lack of democratic values. This doesn’t portend well for a changed set of circumstances in the future. The worst thing is that this lack of values is not most manifest in our downtrodden common people but most glaring in our educated, the literati and the chatterati, our thought leaders. Bitter political divide is not unique to Bangladesh; in many of the advanced democracies of the world, division among the supporters of the main political parties is more deeply entrenched and intractable. Many of these democracies have been working fine for many decades without requiring any ‘national consensus’ between the main power players. The difference in our country is that our politically conscious class lack the consensus on the minimum rules of engagement required for a functioning democratic society. I will not go into a litany of lacking in our national fibre now; that will come later. The important thing is to understand that our ingrained characteristics are not going to go away soon. Hoping for a dramatic event that will trigger a national spiritual revival which will lead to a moral rejuvenation, may remain an elusive dream. As all development psychologists know, the idiom “child is father of the man” is so universally true that it has become almost axiomatic. We are what we are and we will remain so. I will argue that any system of governance we envision for our future must build on the record of democratic conduct we have demonstrated over the first four decades of our nationhood. In spite of some bright spots the records of both our people and our political regimes leave much to be desired. While we tend to be very proud of our elections as emblems of our democracy we should also know that democratic values of a political regime are not truly demonstrated by how it came into power but how the regime gave up power. All of our political regimes have failed miserably in this simple test of democracy. This implies a failure of our polity or a failure of our system or both. In this series of essays, I would argue that we are looking at the problem of governance from the wrong angle. We do not have a good system manned by bad leaders. We have an inappropriate system that amplifies the worse of the bad leaders. Our longing for a capable leader a la Lee Kuan Yew or a Mahathir or even a Nitish Kumar of Bihar is emblematic of our nature of believing that the locus of control of our own fate is not in our hands. I would argue that almost everything that has been great and good in Bangladesh in the last four decades happened because of our common people, our entrepreneurs, our social leaders. The political governance, on the other hand, has been a giant rent seeker; to borrow a popular expression from Matt Taibbi, politics has become “a great vampire squid wrapped around the” face of nation, relentlessly sucking on the lifeblood of the nation. (2) I would argue that we should look for a form of national governance that severely curtails the power of governing politics and force the political parties to behave well. I would argue that the only way to break out of this perennial cycle of nightmares may be to go back to the drawing board. At the end I would argue that the current political standoff is a mutually exclusive zero-sum game for the two main players and there is no equilibrium to be found. A third party intervention may be the only way forward. In 2011, while world historical events like the Arab Spring and the European debt crisis were occupying the world’s attention, a political crisis in a small European country kept some of the global political observers intrigued and entertained throughout the year. In that year the government of Belgium created political history by breaking the world record for longest time to form a elected government after an election. The parliamentary general election took place on 13th June 2010 and finally a elected coalition government was sworn in on 6th December 2011. During the the 541 days between these two dates, a limited, transitional caretaker government looked after the necessary affairs of governance. Since this was the longest post election transition time in a democracy and the longest time with a limited caretaker government, the Belgian experience with no elected government 2010-11 generated lot of interest throuout the world and became a interesting case for study in political science. Almost like a accidental natural experiment, the affair showed some interesting lessons on the role of government in a functioning democracy. Political gridlock is nothing new in Belgium, it directly stems from a deeply divided population. The modern state of Belgium was created from United Kingdom of Netherlands in the 1830s. Belgium is almost equally divided between two culturally distinct regions, Dutch speaking Flemish region in the north and French speaking Walloon region in the south. The enmity between these two neighboring community is hundreds of years old. In the 19th century only the French speakers could get government positions and the Flemish were effectively 2nd class citizens. In the 20th century, the northern Dutch population gradually gained economic prominence and now the Flemish region regularly threatens to secede from their poorer southern counterpart and become independent. This ethnic divide is also the prime mover in Belgian politics. In Belgium there are two sets of parties for each ethnic group. Conservatives, liberals, leftwing, green all have Flemish and Walloon counterparts. (3) This multitude of parties and a proportional system of electing parliament members mean that protracted negotiations and coalition forming have been the norm in Belgian politics throughout its modern history. The last crisis began when the right wing Flemish N-VA party, whose platform was dissolution of the Belgian state, won the largest amount of seats in the Dutch-speaking parts and the pro-unity Parti Socialiste won in the French speaking region in the June 2010 election (4). All attempts to form a coalition government failed so the King of Belgium asked the outgoing Prime Minister Yves Leterme to form a Caretaker government while negotiations went on. Everyone expected the coalition negotiations to last for few weeks at most, instead it went on for more than 500 days. The small Caretaker Government of Leterme had very restricted power. It could not take any policy decisions, no major personnel decisions, even it was financially circumscribed. Every month it could spend only one twelfth of the last year’s budget, so expense was basically pegged to the previous budget. 2011 was the year when the current European debt crisis really became a storm and buffeted economies of every European country. Belgium, with its powerless Caretaker government and endless political uncertainty, seemed to be a prime candidate for a financial crisis, especially since its public debt was well above the European average (5). 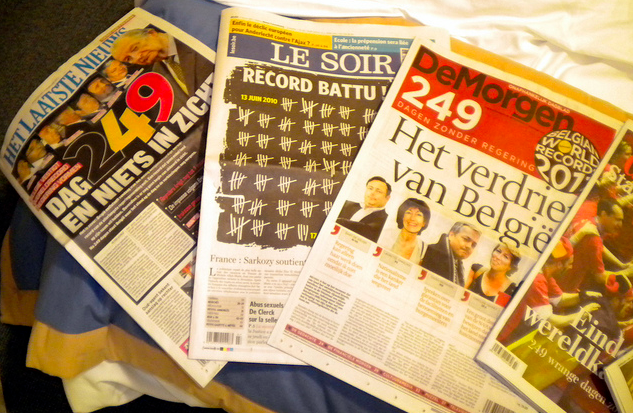 But something curious happened that made the Belgian political crisis an interesting study in governance. Throughout 2011, Belgian long-term bond yield remained at manageable level while for many other debt-ridden countries the yields shot up to unsustainable level. Belgian quarterly GDP growth was among Europe’s top performers throughout 2011. Business confidence remained high, at one point rising to the highest in three and a half years. Many analysts said that Belgium’s very political paralysis was an important factor in weathering the financial crisis better than most other countries. In absence of an elected government, Belgium did not pass severe austerity measures that were taken by most other countries. (6) Moreover, the very absence of government removed a source of uncertainty for the markets as they knew that previous policies and laws would remain in place. It was not only just in the economic sector that Belgium’s Caretaker non-government did better than most governments but also in administrative side it performed beyond expectations. Belgium automatically assumed the role of European Union presidency in the 2nd half of 2010. EU presidency is a role that is held by national government of an EU country and every six month the role goes to a predetermined nation. The function of the EU Presidency includes setting EU meetings, supervising the upper house of EU legislature, determining its agendas and others. (7) The small caretaker government took care of the six-month long EU Presidency without any hitch. Meanwhile throughout the 540 days, trains ran on time, garbage and tax were collected as per schedule, everybody got paid on time. With this detailed description of a political incident in a small European country, I am not trying to draw any comparison between Bangladesh and Belgium. These two countries, other than the same capital letter in the name, are as far apart as two countries can be. I am also not trying to show the virtues of a bureaucratic state, in Bangladesh if there is one group of people more distrusted than the politicians, it is the bureaucrats. At least the people have the satisfaction of seeing many politicians getting some measure of comeuppance in every half a decade. The corrupt and inept mandarins of our country remain untouchable. I brought up the Belgian incident of no government because I think we are looking at the problem of good governance in Bangladesh from the wrong angle. Instead of governments that will do good, we should look for governments that cannot do evil. Max Weber defined State as the entity that has a monopoly on exercising legitimate violence over a given territory. In a modern state, citizens have given up the right to restrain, force, imprison or kill someone to the state. Government as a manifestation of the state exercises that monopoly power. In a democracy, a political regime becomes the leader of the government but it never becomes the government. Government remains representative of all political parties and all people. The separation between political regime and the government is the main distinction between constitutional democracy and despotism, where a person or an organization wields absolute power of the state. In Bangladesh we have repeatedly failed to protect our democracy from despotism, be it elected or usurped. That’s why every five years or so we have to have a new revolution, be it popular or palace. This failure of democracy is of course a reflection our failure as a democratic society. But I would argue that this failure also stems from the flaws in the original democratic system devised after the birth of the nation. Like the political and religious ideologies that are affecting humanity since the beginning of 20th century, the founders of our democracy have concocted a system for a nation and people that we ought to be not a nation and people that we are. In the 2nd part of the essay, I would argue that the 1972 Constitution and First Pass the Post system of election have proven themselves to be inadequate to aide our journey towards a democratic polity. They have accentuated our deficiencies and attenuated our strengths. If we want to break out of this cycle of elected despotism and revolutionary overthrow, we cannot just depend on patchwork and poultice. A fundamental revision may be necessary. Interesting argument, especially through the lens of comparative politics. You do note however the multitude of constraints of the European continental democratic systems. You’re also talking about a government and society that has to take on policy challenges of an entirely different populace and context. How would you relate this to Bangladesh, I’m waiting eagerly for part 2…. Interesting to see the Belgian case. To me, the Belgian lesson showed that above all; it is the players of the system who are to be credited or discredited, not much the system itself. If the players aren’t capable, then no matter how good or flawless the system is. That is also evident in our country too. We have been boastfully inventing refinement after refinement to achieve the democracy. How far did we reach? To me, starting from the commoners to the top leaders, we do not possess the philosopy of democracy at all, hard to explain the underlying causes behind this in short. In a single term, lack of rationalism may be the root cause. No wonder democracy would be nothing but a paper tiger in Bd. Apparently Bd. Version of democracy means a somewhat fair election which can change the ruling party, surprisingly even the highly educated elite citizens are contempt with this form of democracy. It would be very interesting to see how you would relate the problem of establishing democracy with the 1972 constitution. I can’t think much at this direction, only except some of the then Mujib government’s undemocratic actions, which I am pretty sure you will not point such incidents as the root cause. No matter in which direction the war criminal trial goes, it is certain that the recent political debacle will put a deep scar in the national politics for a long time. Standard of politics would deteriorate farther with extreme polarization, and needless to emphasize more rampant use of religion in politics. Unlike the Belgians, If we wouldn’t bear a homogeneous ethnical identity then I am almost certain that we would be facing a real civil war. Hi Adil, thanks for the feedback. Of course our people as well as our leaders suffer from democratic deficiency. But I would also say that we have some characteristics that makes us more democratic as a whole. We are undisciplined therefore hard to regiment and that may have also saved us from worse sort of autocracies. Anyway, in part 2 my main thrust is we need a system appropriate for what we are not what we should be. I would also say that in search of stability we have sacrificed check and balance so much that democratic process has become too hard to attain. This part was just the preamble. I hope to lay down my main points in the next part more elaborately. I do not see much possibility of any 3rd party intervention or emergence very soon. No matter how disturbed the citizens are, they may use dirty slangs aganist the politicians…..all are bastards….theieves…dacoits….but at the end eventually they would vote only for the major parties. They wouldn’t vote for the sensible responsible candidates without any big party seal. System? I do not believe that any system would work unles you can develop certain values those would be strictly followed by all quarters. An excellent overture; looking forward to the second part of the essay. True that “A third party intervention may be the only way forward; and First Pass the Post system of election have proven themselves to be inadequate to aide our journey towards a democratic polity” – yet, a plausible solution remains elusive. A lot of the issues lie at the very basic level: independence Judiciary, Bureaucracy, Administration, Police forces… then we got some idiosyncrasies and local situations: armed student cadres, high unemployment, lack of educational opportunity, poverty and corruption, which are well entrenched and endemic in our society. For example, how could we build resistance to nepotism when many of us are also endowed with its benefit? Not dissimilar to our previous efforts, the journey to change will be tough, specially with ever evolving divisions we are experiencing. I am sure you would also take into account the overwhelming support, estimated to be around 40% a piece of the total voters, the major two parties enjoys, in spite of their perpetual follies and torcher inflicted on the population. I don’t exactly know to what extent, but would suspect that unlike the city (educated?) people, few among the underprivileged and in rural areas cares about or even have the luxury to care about these deep and well meaning issues. Thus, it is left to opinion-makers, so called “intellectuals” or any other interest groups with power to canvass their preferred narratives. What is more, this days it is fashionable to engage in abuse-filled debates through ubiquitous social media and blogs. like you said, of course, escape routes would need to be envisaged within the prevailing environment, with a hope that there is definitely a light at the other end. Congratulations and good luck. Belgium is divided, our division is orchestrated divide and rule. Elect 300 independent candidates instead of AL and BNP, let the 300 evolve into a third centrist party, then we will have peace, sustainable and inclusive growth, and real democracy. Otherwise, democracy will be usurped by extra constitutional or extremist forces. Join Jukto Front on Facebook.